We were delighted to be asked by Skyhawk Global to design and build a new website. 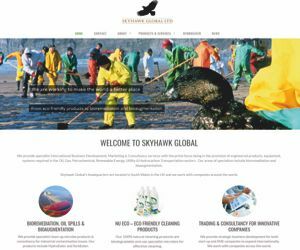 Skyhawk are based in The Business Centre in Barry and specialise in bioremediation (using natural bugs to breakdown oils, toxins and other industrial waste) and natural cleaning products. They also have international partners around the world. The business is enjoying considerable growth and has won awards in recognition of their eco-friendly ethos and growing success.